Hey peoples. Today I have the pleasure of showing you my feet wearing a fancy pair of toe-less socks. Arrrgggh!! Ok, for those of you that didn't run away in horror, thanks for staying - and because you did, you will get the opportunity to win a couple of pairs of Pedi-Sox at the bottom of this blog post. 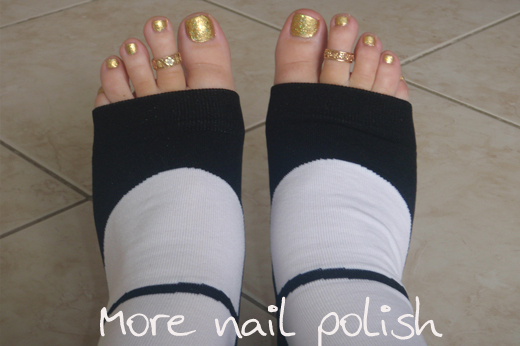 Pedi-Sox have been around for a while and I've seen a number of reviews popping up on nail blogs over the last few months. Pedi-Sox are pretty much a pair of toe-less socks. The purpose of which is, to do yourself a pedicure and rub all those nice smelling cremes into your feet. 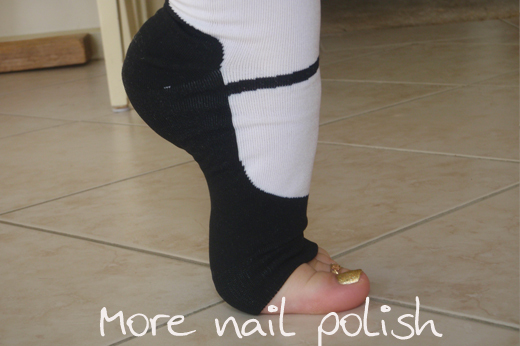 You then put your Pedi-Sox on and start painting your nails. So that's exactly what I did. The Pedi-Sox allow you to paint your nails and let them dry whist a) keeping all those moisturizing lotions soaking into your feet, and b) keeping your feet warm during the cold months when you still need your toes to look nice. It's right in the middle of winter here, and these kept my little footsies much warmer whist doing my pedi. The Pedi-Sox come in a range of colours and thicknesses and they pretty much fit any foot size because they are toeless. I don't know what else to say about a pair of toeless socks, except that they are pretty cool. Ok, so now the feet pics. Feet are kinda weird and scary, and not really the sort of thing one likes to share on their blog on the interwebs. Whilst I always keep my toes painted - 365 days a year, I can't say I'm a big fan of my feet or toes. I think it stems from when I was younger and for about 13 years I did classical ballet. Ballet does horrid things to your feet and toes, you get nasty blisters, callouses and corns all over your toes from pointe shoes. So all things considered, I guess they aren't too bad. Because of the ballet, I've always kept my toe nails really short too. Can I also say that I have a pretty average sized foot at 8.5, despite the stumpy looking toes in these photos. I also always wear my toe rings. I got both of these from Hawaii. The one on the left from a jeweller in the International Market Place, the one on the right is from Tropical Toes in Lahania, Maui. It actually broke on my recent cruise, but a local jeweller was able to solder it together again. The polish on my toes is OPI I Get a Kick out of Gold topped with Lynnderella Be Mining for a Heart of Gold. I always wear gold polish on my toes, my usual go to polish is Orly Luxe, but I will mix it up a bit. Ok, now the feet. I'm wearing a pair of the Mary Jane style socks. I don't have the flexibility in my ankles and feet any more to get right up on the balls of my feet, my ankles feel so weak compared to how they were when I did ballet. If you want to get a pair of Pedi-Sox, your best bet is to ask your local salon to carry Pedi-Sox. In Australia CNE Beauty Salon Supplies is the distributor who can stock the salons, or you can buy through them if you a nail tech professional. You can check the Pedi-Sox website for other distributors around the world. Anywho, lets get to the giveaway. Its just a rafflecopter one, so you all know what to do. The giveaway is open internationally and closes in one week. There will be two prizes, both receiving two pairs of Pedi-Sox. Product provided for review and giveaway. I'm back today with another Lynnderella polish, and I probably sound a bit like a broke record when I say that I LURRVVEEE this one. Opal Intuition from the recent Birthstone and Talismans collection is a polish that is chock full of iridescent glitters, in green, blue and orange. 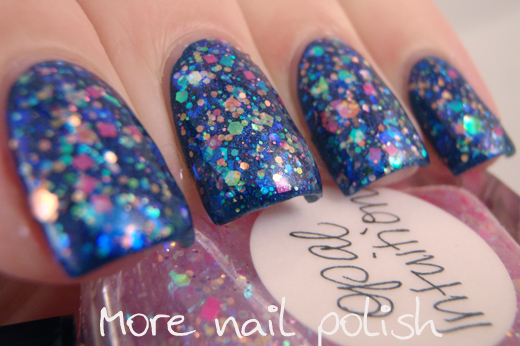 There are also neon pink glitters and lilac holographic microglitters, all in a blue shimmered clear base. 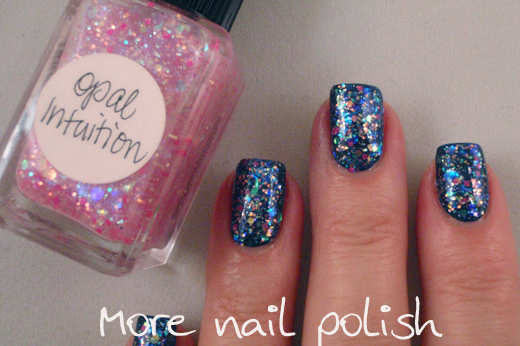 The polish actually has a pale pink jelly appearance in the bottle, but I think that is just created by the glitters. 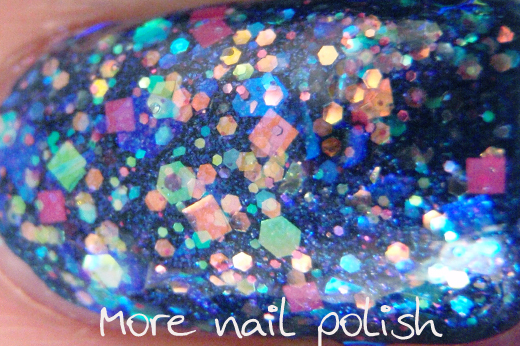 I really wanted to create a dense glitter look with no empty gaps, so the appearance would be similar to a dark opal. I started with a base of OPI DS Fantasy and then layered three coats of Opal Intuition. This dried nice a smooth for a glitter polish with that many coats, I used one coat of Glitter Tamer and one of Seche Vite and it was glassy smooth. 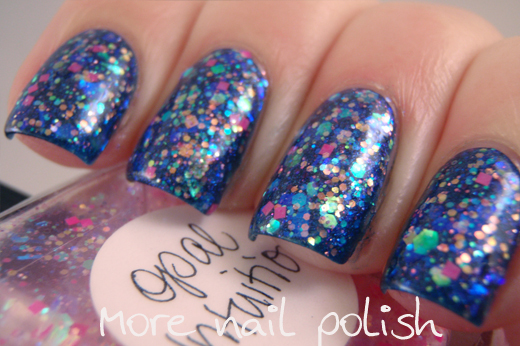 I can't rave enough about how stunning this mani looked in real life. It was exactly the look I was going for with glowing iridescent glitters over a dark base. I can't wait to wear this again. 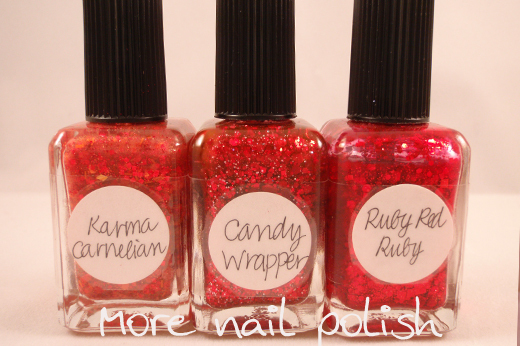 Lynnderella polishes are available from Lynnderella.com for USA and Canada deliveries, Norway Nails for European deliveries and now in Australia through Glitter Connect. 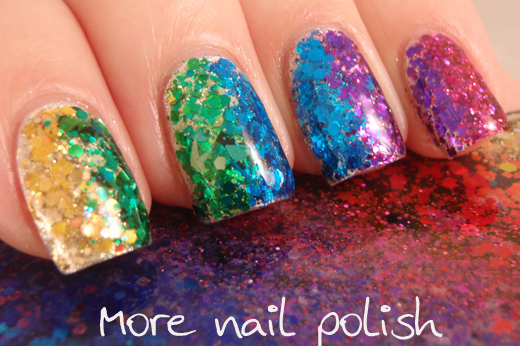 Glitter Connect has recently dropped prices on Lynnderella polishes so they are pretty much a comparable price to the US now (when you consider the dollar conversion) - so that is totally awesome! The more polishes I wear from this collection the more it becomes my favourite Lynnderella collection yet! 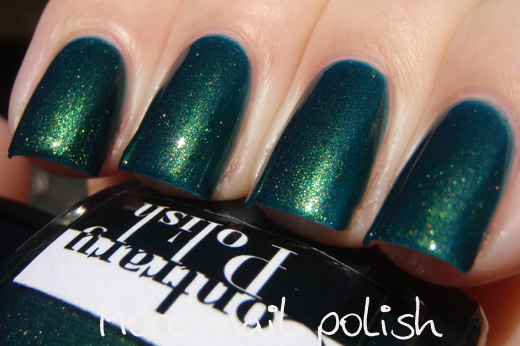 Welcome to another year of Picture Polish's Blog Fest - this year we are celebrating the Year of the Blogger! This years blog fest is a bit different from the past two (can you believe this is the third blog fest already!) 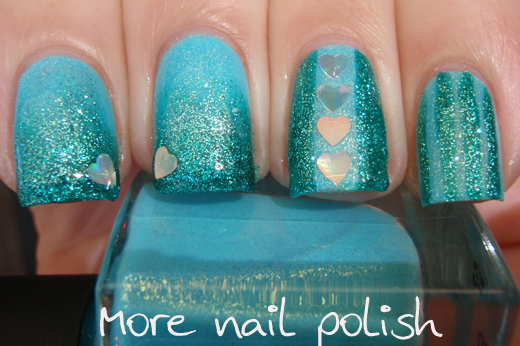 Rather than releasing new shades this year, Blog Fest 2013 is all about nail art. 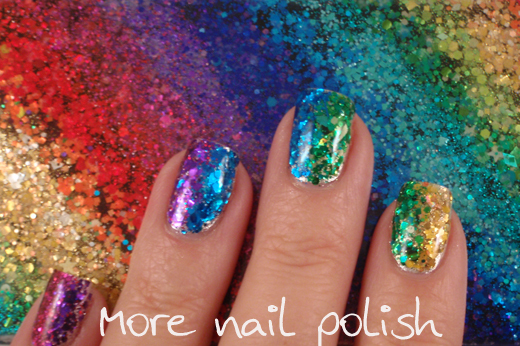 We were all challenged to create new nail art looks using three Picture Polish shades. When selecting shades, I chose the three new collaboration shades - as they were the only Picture Polish colours that I didn't yet own. It was only after reading through the Blog Fest instructions again that I realised what a challenge I had set myself. If I'd have thought about it a little more, I would have chosen to use three shades that compliment each other better, you see, the instructions said to only use the three Picture Polish shades provided to you. Wowser, I had chosen three very different polishes and finishes and it was going to be a real challenge to make these three polishes look good together in a single mani. 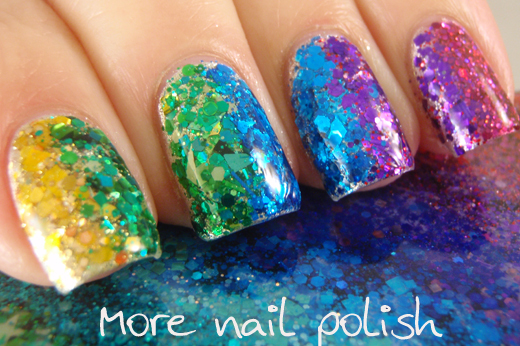 Frosting is a pink creme with glitters, Whimsy is a blue creme with gold shimmer and Sea Jewel is green with silver glitter. I really didn't know how I was going to pull a design together. But everyone loves a challenge right! 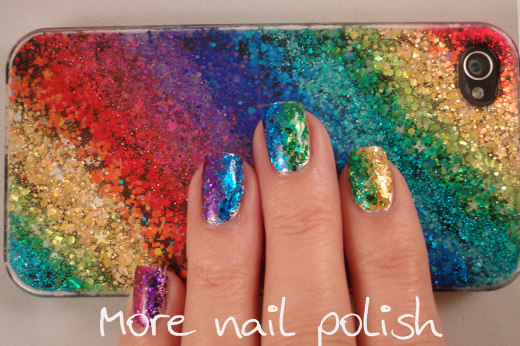 I created a skittlette mani. I started with a base of whimsy. 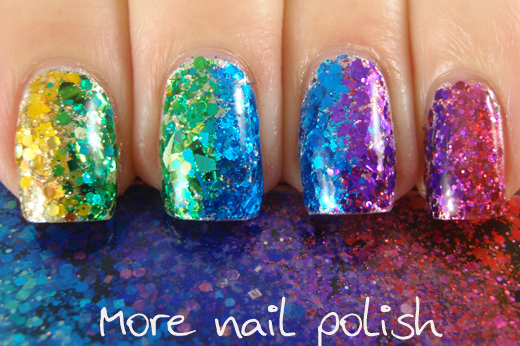 Then on my index and middle fingers I did a gradient using sea jewel. On my ring and pinky fingers I did lines of different widths using sea jewel. To pull all the polishes together into one design, I carefully picked out some of the holographic silver hearts that are in frosting. 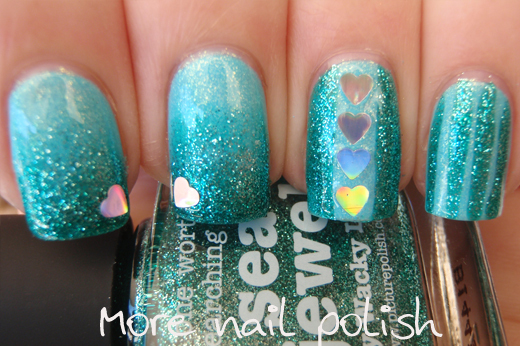 I cleaned the hearts up using acetone and them placed them onto my nails using top coat. I love Picture Polish's Blog Fest, there are going to be so many amazing manis popping up all over the world over the next 24ish hours. 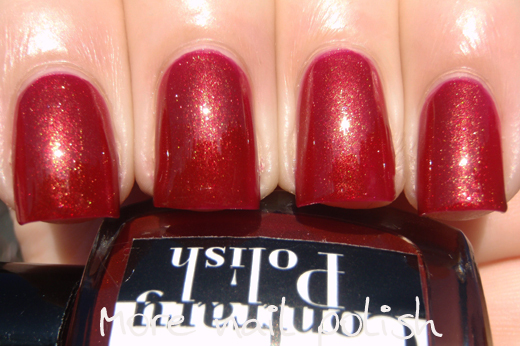 Picture Polish will also have all blogfest pictures up on their Pinterest page. 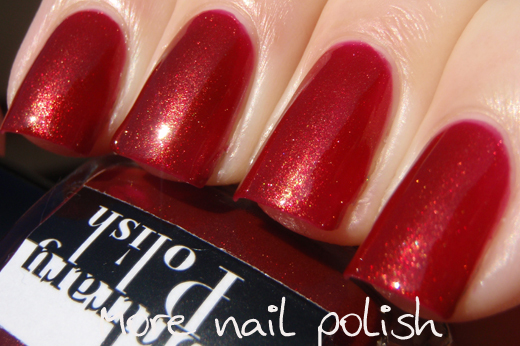 Picture Polish are available directly from their website or through any of their Network members.You can also follow them on Facebook, Instagram, Twitter and YouTube. Last time I was invited by the Born Pretty Store to select some items to review, I spied that they had a number of iPhone cases and other iPhone accessories. 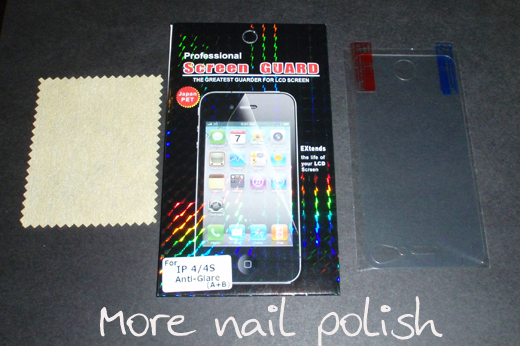 I chose a couple of different items to try out and show you, specifically the clear iphone cases, a Chanel nail polish design case and double sided screen guards. 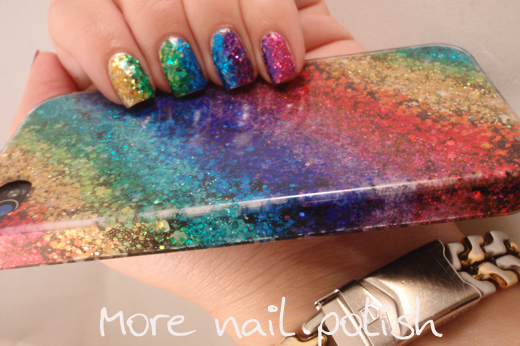 But don't worry, while I'm reviewing phone cases, this post is still totally nail polish! I'm going to start off with my favourite, the clear iphone cases. I got a couple of these. On the right you can see what the product looks like, on the left is my finished creation. 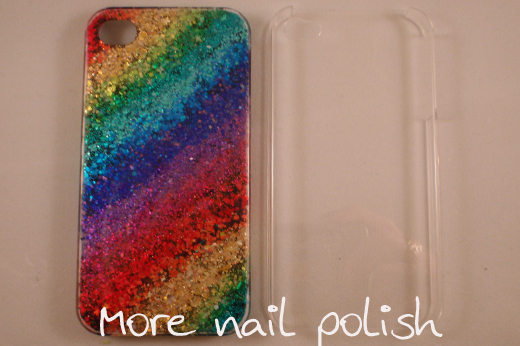 All I did was paint the inside of the case with various glitter nail polishes. 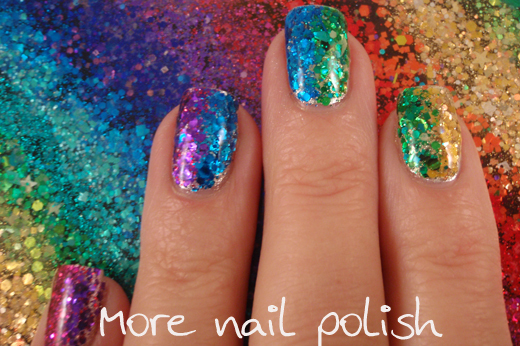 I chose to use Lynnderella polishes, because they are the polishes in my collection that I can create the best solid colour rainbow in glitter out of. I did two thin coats of each glitter polish and then one final layer of black polish to create a nice solid background. I then left it to dry for several days to ensure it was totally and absolutely dry before attaching it to my phone. 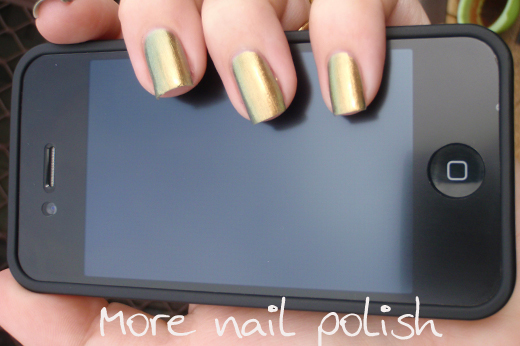 The main thing to remember is not to put the polish too thick, because not only will it take forever to dry, but if it's too thick then you may not be able to still get the cover on your phone. The clear iphone cases are available from the Born Pretty Store. They are normally $2, but they are 50% off right now so only 99c each. At that price you could paint a whole bunch of them to match your favourite nail polishes and take matching your polish and accessories to a whole new level. The other iphone case that I got is a slim line rubber one that has a black surround and the image of a bottle of Chanel Peridot on the back. These cases have been around for a while and since I first saw them I knew I needed one. I was really pleased with the quality of this one, the rubber case provides the phone with some protection and the bottle design on the back is glossy, hard and looks very nice. The Chanel polish cases come in a range of polish colours and are available from The Born Pretty Store. Here is my Chanel Peridot iPhone case with me wearing Chanel Peridot. 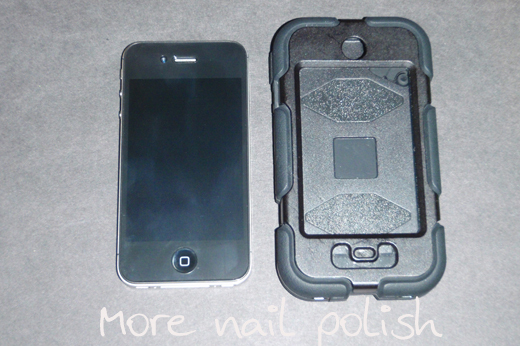 I also tried out some of their iPhone Screen Guards. I didn't have a screen protector on my phone because of the type of cover I previous had, and seeing as I wanted to use my new nail polish cases, I thought I should get some protectors.. The pack I got provides covers for both the front and back of the phone. I found them really easy to apply and I got them on the front and the back easily without any bubbles. If you're thinking of buying anything, don't forget to apply my 10% off code too! 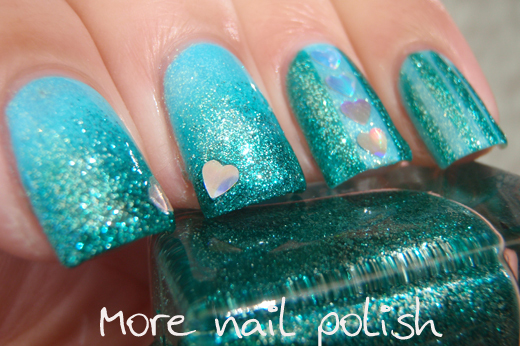 I've never hidden the fact that I love Contrary Polish. 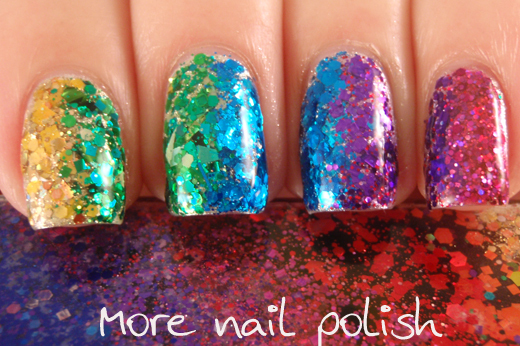 I've been nothing but impressed with every polish from the Contrary range and I love their smooth intense shimmers. Today I have the three polishes from the recent Colour Context Collection. All my photos are taken in full sun, because I love how that intensifies the shimmer. In the shade and indoors, these colours do appear darker. 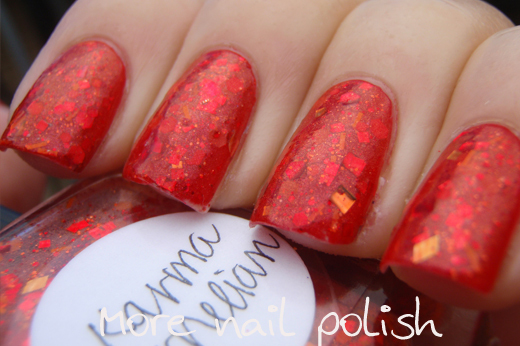 Blood Orange - An orange leaning red base with gold shimmer. 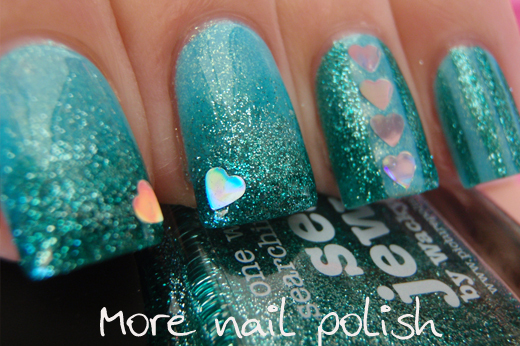 Perfect two coat coverage, topped with Seche Vite. 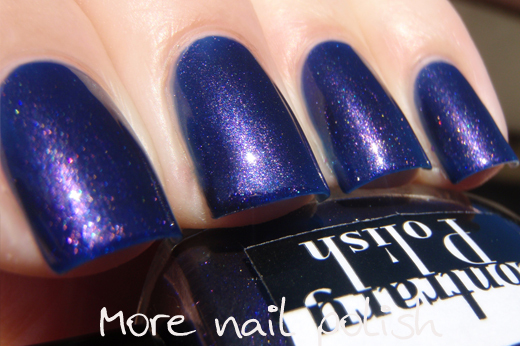 Greenhouse - A blue jelly base with gold shimmer. 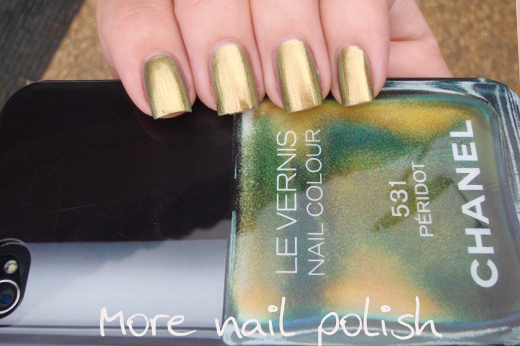 The jelly/shimmer combination makes the polish look green. Completely mesmerizing. I did three coats for an intense colour, topped with Seche Vite. 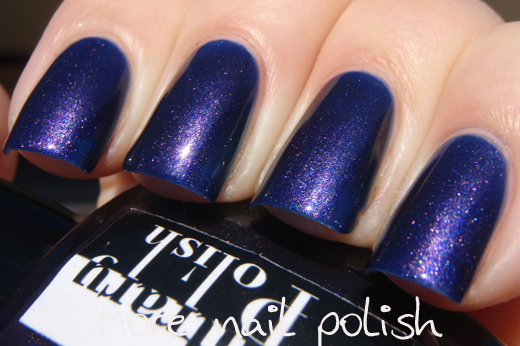 Indigo Rose - A blue base with a pinky red shimmer. 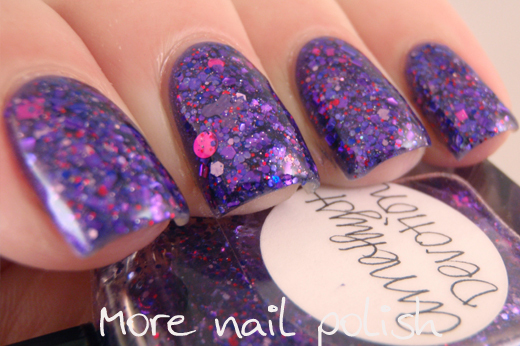 The combo of the blue base and red shimmer gives an overall purple finish to the polish. Another stunner. I again did three coats to ensure a nice deep colour, topped with Seche Vite. 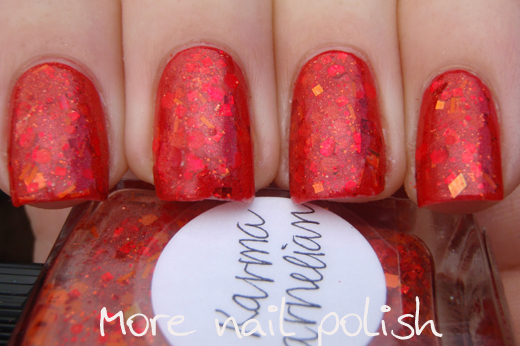 While I love wearing Contrary Polishes on their own, I find that I wear them most as undies for glitters. On so many occasions I reach for a Contrary as the perfect base colour. 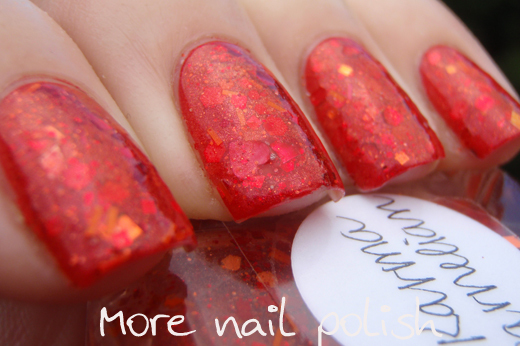 Contrary Polish recently celebrated it's one year anniversary (and released a celebratory polish for the occasion). I can't believe it's only been a year! Happy Anniversary to Carrie and her lovely brand, which is I'm sure will continue to be one of the favourite indie brands. 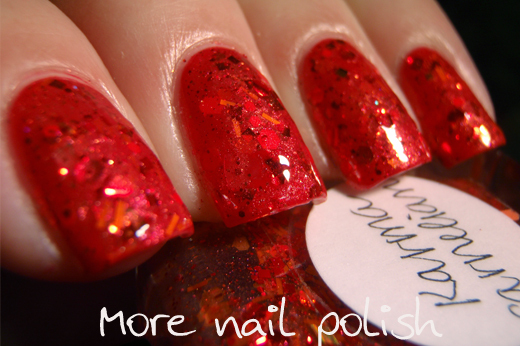 Contrary Polishes are available from Llarowe in the USA and from Shoppe-Eclecticco in Singapore. 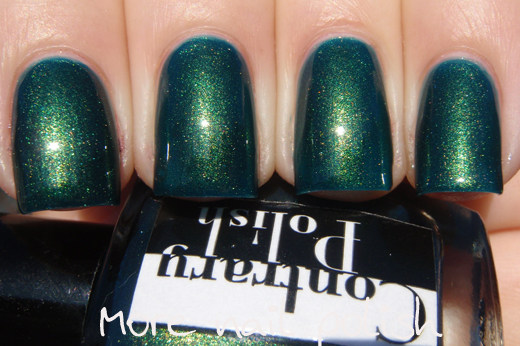 Minis are also available directly from Carrie on the Contrary Polish blog. Here are two more Lynnderella polishes from the most recent Birthstones and Talismans collection. 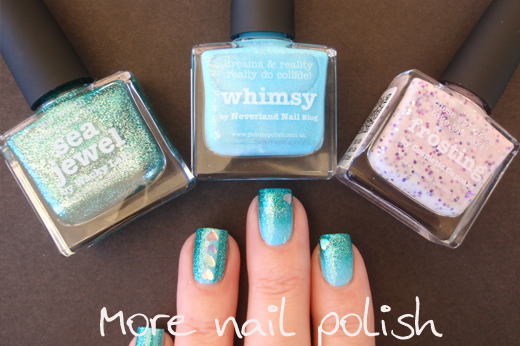 I've really loved wearing these polishes. 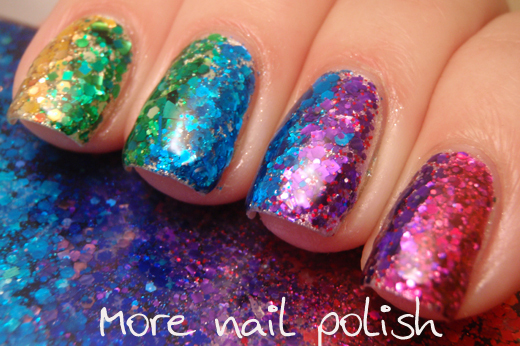 From a distance they look like a simple single coloured (albeit very sparkly looking) glitter manis, but when you look closer at them, you can see the hugely diverse range of glitters all in various tones of the same colour. Amethyst Devotion - assorted shades and shapes of purple and lavender glitters accented with red and magenta glitters in a multi-shimmered clear base. The glitters in this polish are generally much finer than in the other polishes from this collection I've tried so far, although there are some larger glitters in there as accents - such as the magenta dots and the purple butterflies (see if you can spot them on my nails) The finer glitters meant that the polish dried a little rough and needed a good few coats of top coat to get it smooth. 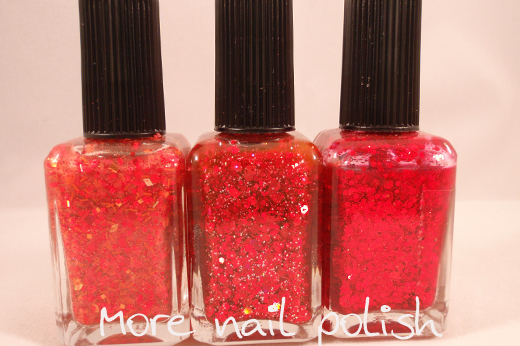 I've been trying a bunch a different top coats to see which ones work well for hungry glitters. 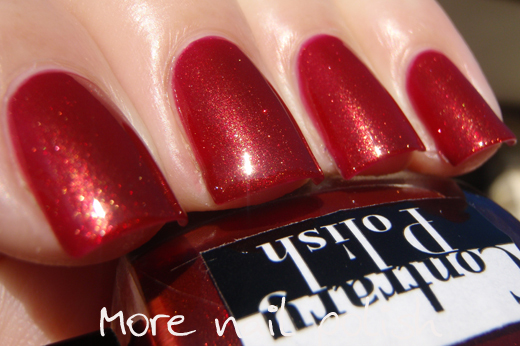 I'm nearly out of my made in Australia version of Ulta3's Non-Chip, which was outstanding for smoothing out glitters. Gelous has been ok, Seche gets a bit shrinky when I'm using this much top coat. Color Club top coat dries fast, but seems to soak into the glitters, Lynnderella's Glitter Tamer is totally awesome, but I'm also nearly out of it. My quest continues. This is two coats of Amethyst Devotion over Pretty Serious Poltergeist Puddle. 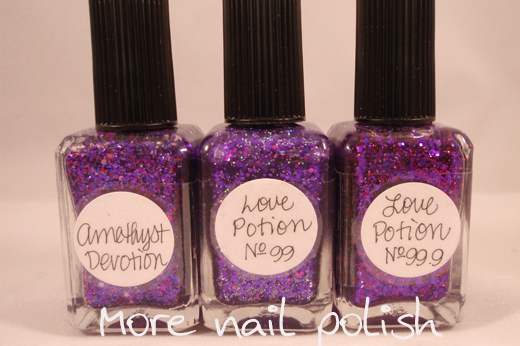 Here are some bottle comparisons with Amethyst Devotion, Love Potion No 99 and Love Potion No 99.9. They are all quite similar colour wise, although #99.9 has more fine red glitter. #99 has more silver holo. 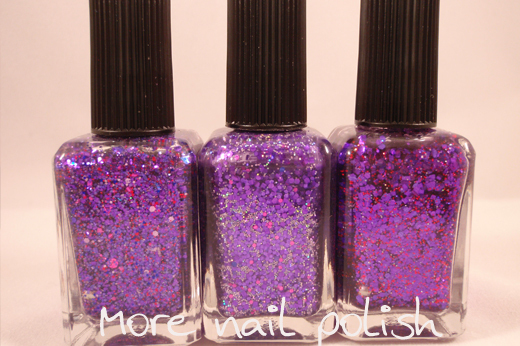 Amethyst Devotion has much more variety in it's glitter colours and sizes. Karma Carnelian - Red polishes, why do you taunt me with your glowing beauty then screw me over with your crappy appearance in my photos! I always have this trouble photographing red glitter. It must be a camera thing. I know lots of people say their camera doesn't handle purple very well. Mine does pretty good with purple, but I can never get that real life red glitter glow into my photos. 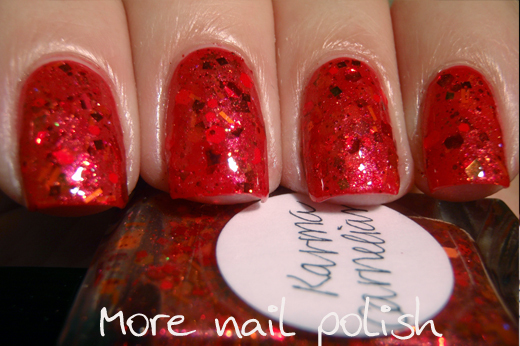 Karma Carnelian has red and orange glitters in a shimmering translucent red-orange base. This is two coats over Maybelline Rouge Red. 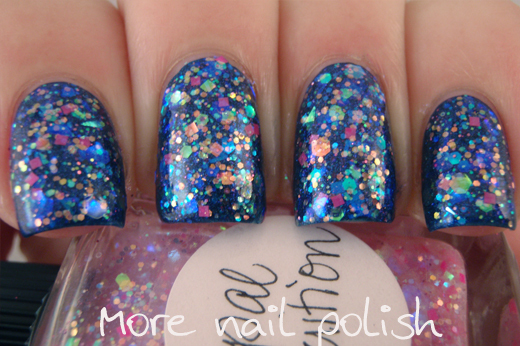 Lynnderella polishes are available from Lynnderella.com for USA and Canada deliveries, Norway Nails for European deliveries and now in Australia through Glitter Connect. Polishes provided fro swatching and review.